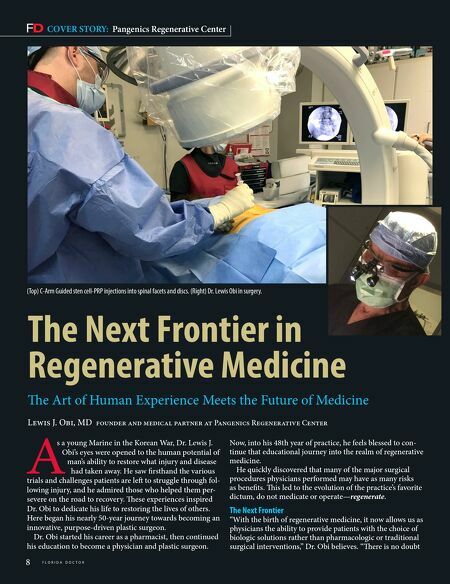 S P R I N G 2 0 1 9 9 in my mind that regenerative stem cell-based therapies will become the next frontier of medicine." Shortly aer he began practicing as a plastic surgeon, Dr. Obi realized that both reconstructive and aesthetic plastic surgery did not fall into the mainstream of medicine. Aer much planning, however, he was determined to construct a free-standing ambulatory surgery center. At that time, the concept of such a center was almost unheard of, according to Dr. Obi, and it became the first fully-licensed plastic sur- gery center in the state of Florida. For 42 years his ambula- tory surgery center, the Samuel Wells Surgicenter, has been a key player on what is now the Memorial Hospital, Brooks Rehabilitation and Obi Plastic Surgery Clinic campus. Aer 35 years of success working with adipose-derived (body fat) stem cells, Dr. Obi established the Pangenics Re- generative Center, providing regulated quality care in adult stem cell regenerative medicine. e Pangenics team has brought together a group of physicians and surgical staff with diverse talents and expertise—all with the patient's well being as their primary goal. is complex team provides years of knowledge, experience and, most importantly, dedication. e Pangenics team is comprised of three board-certified specialists: Dr. Obi, Dr. David Heekin, and Dr. Kenneth Eaddy. Each member excels in their respective specialties, which includes plastic and reconstructive surgery, ortho- pedic surgery, pain management, spine specialists, urology and internal medicine. UF Health surgeons performed the first kidney transplant in Florida in 1966, and have performed more than 4,500 kidney transplants over the past 50 years. S P R I N G 2 0 1 9 9 >> (Top) Thirty-six step process for producing stem cells from patient's own fat. (Right) Stem cell injections into hand.